UPDATE: As many of you have probably seen already, news is out that Daredevil has been canceled by Netflix. It turns out that my optimism was misplaced and this show has ended the only way it would: due to reasons other than viewing numbers and audience appreciation. Much of what I’ve written in this post is still relevant to the discussion of what might happen next, were the show to continue in some other form. If Marvel is contractually allowed to continue the show, with the same cast, on some other platform, I believe they will. If they intend to reboot the show with a new cast, I’d say don’t bother. It’s this cast or none at all as far as I’m concerned. It’s obvious that there is a lot of speculation (understandable) and misinformation (avoidable) out there. With this post, I hope to clear up some of the confusion. I will do this by looking at what we actually do know, or may at least be able to infer from available sources. To be sure, I’m offering some speculation of my own, but nothing that runs counter to known facts. As I mentioned in my previous post, I’m actually quite optimistic about the prospects for a season four of Daredevil. If this were only a numbers game, I’d say it’s a done deal. Even if viewership is down compared to seasons one and two, it still appears to be one of Netflix’s most popular shows. The fact that season three showrunner Erik Oleson has already 1) pitched his idea for season four to Netflix and 2) publicly posted about it on Twitter is obviously a good indication that season four is actively being considered. By Netflix. Data from just after the release of the Defenders, suggest that Daredevil has vastly outperformed all of the other Netflix Marvel shows (though The Punisher’s first season had yet to drop at the time). This would mean that even if season three had only half the viewership of season two, it would still have twice as many viewers as seasons one of Luke Cage and Iron Fist. The big caveat here is that we don’t actually have access to Netflix’s own data, and secondary sources are only indirect measures that might be inaccurate. 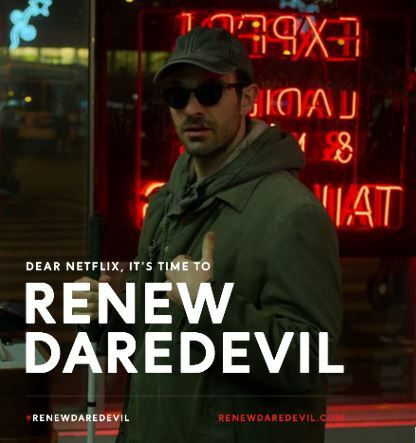 However, we are also moving in different Netflix landscape compared to two and a half years ago, when Daredevil’s second season came out. The number of shows on Netflix, in particular those actually produced by the company, have grown. A lot. I remember when the premiere of a new Netflix show was a special occasion. That’s no longer the case, and that naturally reduces the visibility of each individual show on the platform, and the amount of marketing it receives. Of course, all of this also calls into question Netflix’s longterm business model. Just like services such as Spotify, Netflix is spending a massive amount of money building its library, money they can only expect to recoup if their subscriber count keeps growing. Whether the growing global demand for Netflix’s services will be enough to actually make the company profitable at some point in the future is anyone’s guess. From this perspective, I think it’s actually wise that they’ve ceased the near automatic renewal of everything they put out. It’s better to spend the money on their better-performing properties. And, in the stiff competition with other shows on the same platform, Daredevil at least appears to be performing well. In a weird twist, cutting down on the number of Marvel shows may even benefit those that remain. And Daredevil, The Punisher, and Jessica Jones all share a certain gritty quality that may even allow for more organic cameos and cross-overs than what we saw in The Defenders. What about the suggestion that Disney/Marvel will want to move this and other show to its own streaming platform Disney+? That might be the case, but what people are forgetting is that these shows have come about as a joint venture between Netflix and Marvel/Disney. While I’m obviously not privy to the details of this deal (hey, if you are, let us know! ), the idea that Marvel/Disney can make a unilateral decision to just have them moved is obviously false. But we also don’t know (any extremely insightful entertainment lawyers out there?) what the cancellation for any of these shows means for their legal status after cancellation. Whether a show that Netflix has passed on becomes available – in the same format with the same actors – is something that is likely specified in the deal between Disney/Marvel and Netflix. If Disney/Marvel is free to take these shows to one of their own platforms, a better fit than Disney+ might be a certain other streaming service. After Disney’s planned acquisition of 20th Century Fox, the company will own 60% of Hulu. This would be a more natural home for the more mature heroes we will no longer be seeing on Netflix. Again, that’s if their deal allows for these shows to be resurrected elsewhere with no strings attached. So, what I suspect this comes down to is that Netflix will have to decide whether keeping Daredevil going is a profitably move on their part. I’m willing to bet that, judging by what we know now, they will officially green-light a season four in the near future. The one issue that might complicate things comes down to politics. By continuing with the shows, Netflix is also contributing to building the brand of a company they are now in direct competition with. 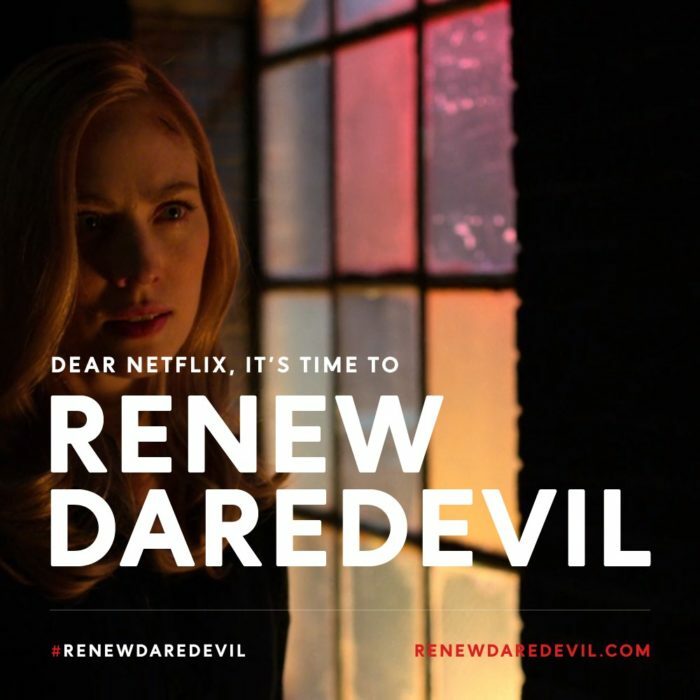 This will matter less, though, if Daredevil is still considered a net benefit to Netflix. All of the ifs and buts that drive these decisions are beyond the reach and ken of individual fans. 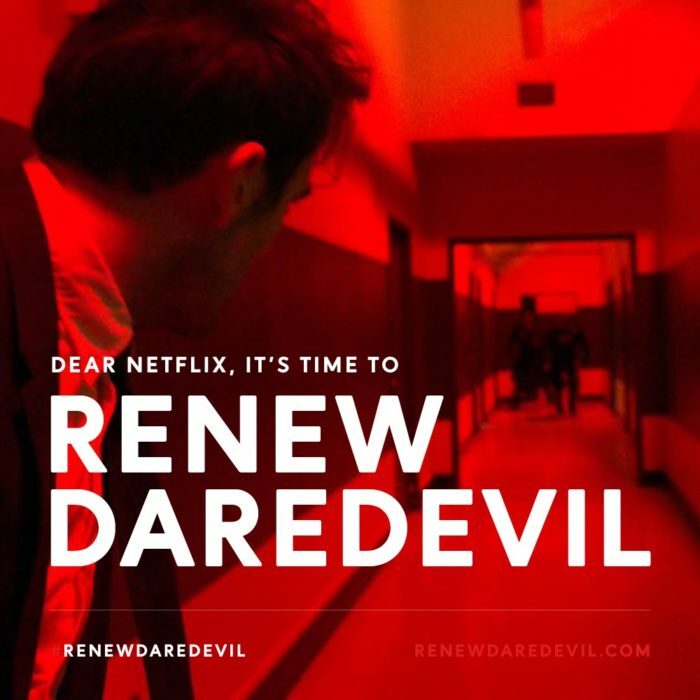 So you might wonder what point there is in launching a campaigning like #RenewDaredevil. My response would be: What is there to lose? 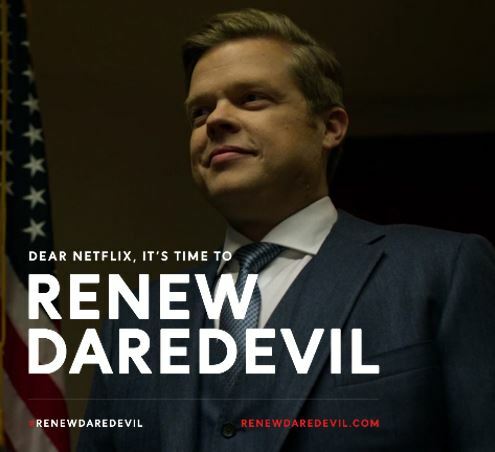 It’s not as if Netflix is going to go back on a decision to give another season the green light because the fans are acting too much like fans. And, if they really are on the fence about this, it might do some good. Who knows? On top of all of this, social media is a great way to bond as a fan community and express our appreciation for the actors, writers, directors and other staff members who have given us this show. From all of us: Thank you! 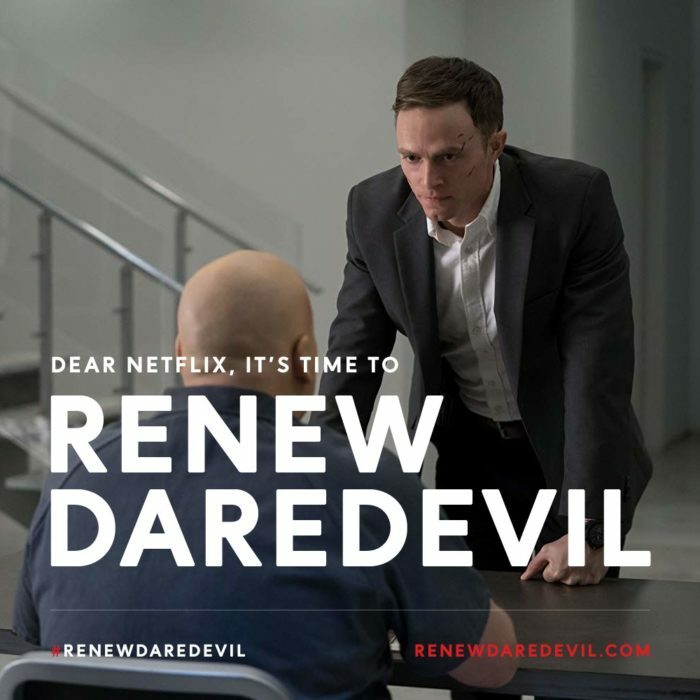 For those who want to join this campaign, here’s the link to the official #RenewDaredevil site (also on Twitter, Facebook, and Instagram). You can also use your own images, or tweet/post without an image (though they do encourage interaction). Choosing to take a more laid back approach? Retweeting or sharing what others are doing is also a good way to be involved. If this type of thing is not for you, then sit this one out. It’s that simple. If you, like me, are in an inconvenient time zone (I’m currently in Tokyo), there are apps that will let you schedule tweets/posts. I will be using Buffer to schedule posts to Facebook, Twitter and Instagram (yup, there is a TOMP Instagram now). Be sure to go to the official page to see what time you should post, depending on your time zone. 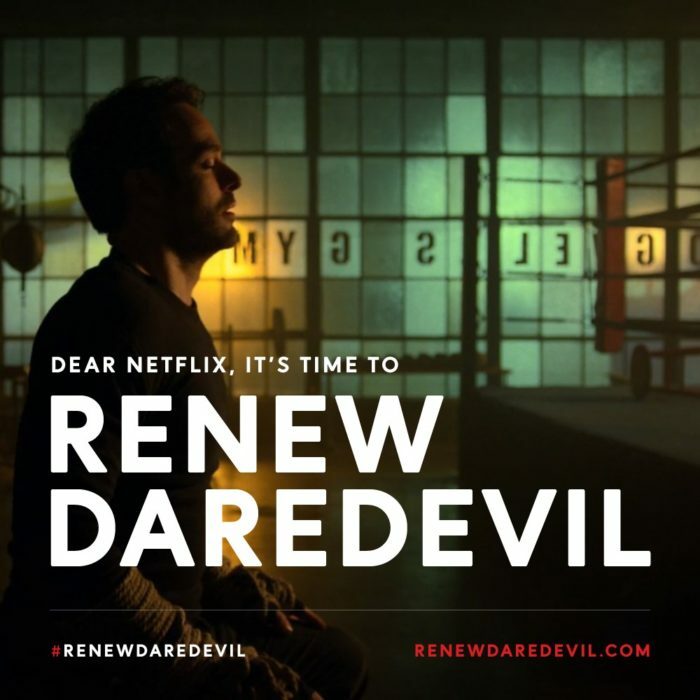 Obviously, you’re free to post about #RenewDaredevil at any time, but there is a point to having a campaign that peaks at a certain time. Have fun with this, that’s what it’s all about! I’ll be back with a new post on Saturday that references some things from season three – mentioned in my review of episode four – before getting back to individual episode reviews next week. 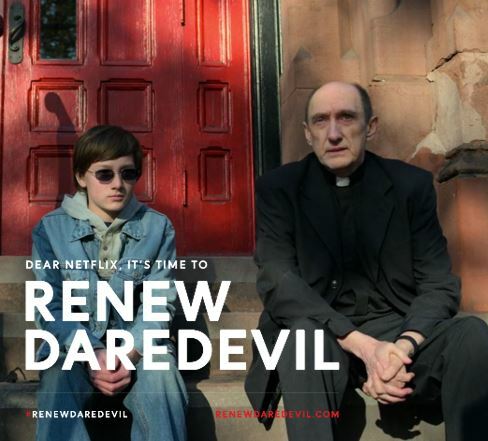 I feel Netflix deliberately cancelled it the day before the renew Daredevil campaign was supposed to officially start. I hope they find a way to bring it back, but it feels like the Disney Streaming Service wants to head in a different direction, so I’m actually not optimistic. I guess I’m just in shock. I took for granted the fact that the two cancellations so far didn’t really seem like a pattern given their very different explanations. @Mike Murdock: Then that makes it double important to make the campaign loud. The cancellation is disappointing. I felt there were still compelling stories to be told about these characters. But I have to admit I wasn’t surprised. I tried to tell myself the cancellations of Iron Fist and Luke Cage were for reasons specific to those shows, but I had a bad feeling about Daredevil’s future after those cancellations were announced. @Christine: I totally agree. If the show is brought back on some other platform, I only want to see it with the original cast. I don’t know how these things work, but if the actors are no longer under contract after the show is cancelled, it could be difficult to assemble the cast again. Charlie Cox has said publicly, several times, that he is willing to play his character as long as they want him to. But if they’re no longer under contract, he and the other actors probably will be moving on and looking for other jobs, unless they know something we don’t. All that being said, I’m grateful for the three seasons we got. Oh my, an unfortunate turn of events?.. I hope not.. Disney can’t host mature content.. not yet?. And for quite some time to come, gee I hope you’re right about this one Chris.. But I believe that they’really in dire straites starting their own streamer since Turner basically gave them the finger regarding LucasFilm licenced Star Wars EU IPs.. desperation? Look out. Disney learned the hard way from Pixar, who ARE the unsung heroes for even Disney’s own anime rejuvination, and while extending that model to the MCU worked magic, MarvelTV sound’s another story.. plus, where they should’ve exercised a high degree of corporate control on that incompetent New LucasFilm creative team, they didn’t. A few days ago I had said to myself “it’s just a TV show”, but actually this show was more. 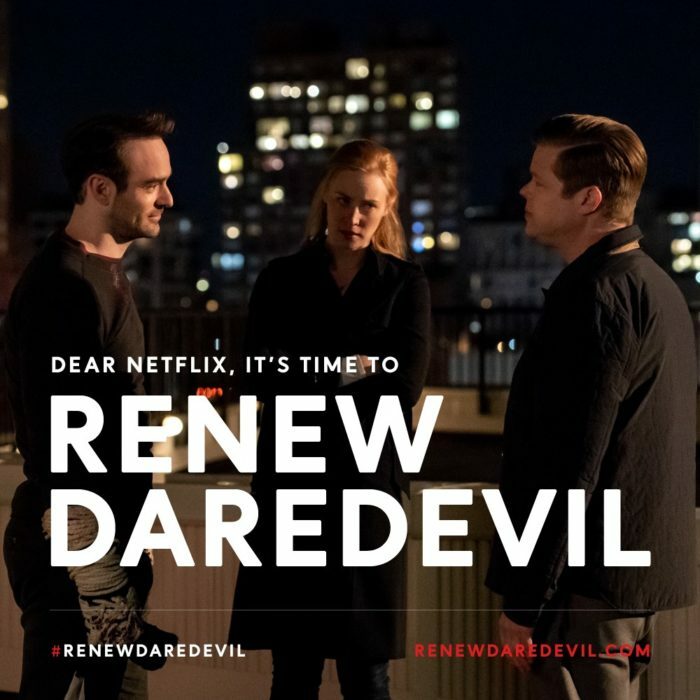 Daredevil provided me with so much more than just 39 episodes worth of entertainment and that makes the cancellation news all the much harder to take. It’s the many hours spent listening to podcasts about the show and the many hours spent reading this blog. (After reading some of the issue reviews Christine used to do, I decided I wanted to read the whole issue. I hadn’t bought or read a comic book in 8+ years). And there was a fun filled afternoon of reading a really good fanfic, I hadn’t read any fanfic for many years either. I don’t think I’d ever been looking forward to a show as much as I was looking forward to season 3. (I had a countdown app running for nearly a year). So I expect I’ll be feeling a variety of emotions for quite a while longer. Honestly, I’m quite okay with the show ending. Good as it was for the most part, I think the actual MCU side of things will be able to handle a new interpretation of the characters just fine. We may yet get a more classic, grinning swashbuckler Daredevil, or even the most important thing: a Daredevil that can intermingle with the likes of Spider-Man and the Black Widow. They really don’t even need to keep much of the Netflix cast, aside from Matt and Turk and maybe Foggy. I left out Kingpin intentionally; D’Onofrio is overrated in the role. But people get so attached to certain actors’ portrayals of whichever character that they neglect how well a character can be done with a different interpretation. I’m down to see whatever they have planned next for TV shows and movie appearances for the character, whatever form that may take. Personally, I’m hoping for Charlie Cox and one or two other Netflix cast members to come back for a new take in the movies that still retains a degree of the grit but still fitting within the actual MCU. DD’s bone-crushing brutality needs to be toned back significantly. Make Daredevil graceful again, I say. Netflix DD was too much the brawler. On the TV side, it’s about damn time Daredevil got his own animated series. Since we’ll probably never see serious and dark Daredevil throw down with Stilt-Man and other wacky villains, I think a cartoon in the vein of The Brave and the Bold would do the Man Without Fear due justice.